Everyday is a great day to show your mom how much you love her and care for her. Get her a t-shirt and she will be reminded every time she wears it all the love you have for her. This t-shirt comes with many great color backgrounds, so you can make it as personal or as colorful as you want. The sizes range from Small to 2XL in a Women’s fit, for that special lady in your life. It is made from 100% cotton, so you know it will be comfy and cozy for your Momma. 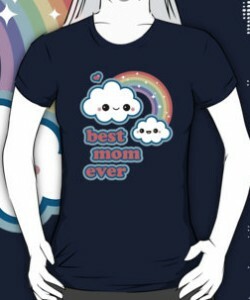 Be the best son or daughter by giving the Best Mom Cloud Ever T-Shirt.